A Justice Department inquiry into how race influences admissions at Harvard University has left selective colleges bracing for new scrutiny of practices that have helped boost diversity levels to new highs across the Ivy League. Harvard and other top-tier colleges closely guard the inner workings of their admissions offices, but they defend approaches that consider an applicant's race among other factors as a way to bring a diverse mix of perspectives to campus. While the schools believe they are on firm legal ground, experts say the investigation could inspire new challenges. "They're pulling the scab off a wound that was healing," said Anthony Carnevale, who has studied affirmative action programs and leads Georgetown University's Center for Education and the Workforce. "This could erupt in a bunch more cases." At the eight Ivy League colleges including Harvard, Yale and Princeton, the number of U.S. minority students in all incoming classes grew by 17 percent between 2010 and 2015, while overall enrollment in those classes grew by less than 2 percent, according to the latest federal data. By 2015, minorities accounted for more than 43 percent of all incoming students in the Ivy League, up from 37 percent in 2010. The trend partly reflects the demographics of an increasingly diverse nation, but the schools also consider race for reasons including a desire to reverse historically low numbers of minorities at elite universities that in some cases began admitting nonwhite students only in the last 75 years. "We're aiming for diversity on our campus and we're achieving it," said Christopher Eisgruber, president of Princeton University. "Universities have a compelling interest in pursuing diversity in their student bodies through a holistic assessment of factors." Eisgruber said he is not surprised by the "continuing political controversy," but it would not be appropriate for him to comment on the Justice Department investigation. At Brown University, the inquiry was a topic of discussion last week, school spokesman Brian Clark said. "The courts have held that colleges and universities may act affirmatively to achieve the educational goals at the core of our academic excellence at Brown," Clark said in a statement. "Through our race-conscious admission practices, Brown assembles the diverse range of perspectives and experiences essential for a learning and research community that prepares students to thrive in a complex and changing world." Word of the investigation startled some who thought the affirmative action debate was settled after the U.S. Supreme Court last year upheld race-conscious admissions at the University of Texas. That case was brought by a white student who contended she was rejected from the school while black students with lower grades were admitted. In the Harvard case, investigators are looking into a 2015 complaint brought by a coalition of 64 Asian-American groups that allege the school uses racial quotas to admit students and discriminates against Asian-Americans by holding them to a higher standard. The Justice Department said it's revisiting the case because it was left unresolved by the previous administration. 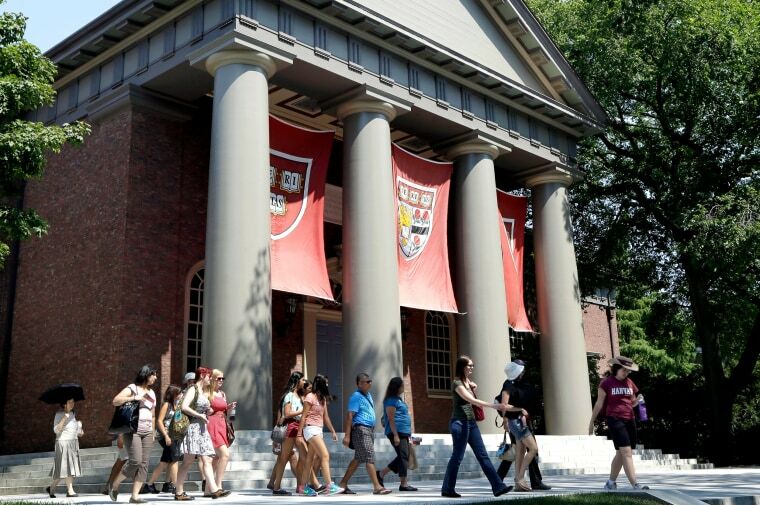 Harvard said its practices are legally sound. "Harvard remains committed to enrolling diverse classes of students," Harvard spokeswoman Rachael Dane said. "Harvard's admissions process considers each applicant as a whole person, and we review many factors, consistent with the legal standards established by the U.S. Supreme Court." Despite the growth in the nonwhite student populations, the schools acknowledge their diversity efforts are aimed largely at drawing students from underrepresented races and ethnicities, a category that often includes blacks and Latinos but not Asian-American students. Princeton's Eisgruber said the last decade has seen a significant increase in the number of Asian-American students on campus, while growth among other minorities has been "more modest." The trend has been similar across the Ivy League, where U.S. minority students other than Asian-Americans made up only 24 percent of incoming students in 2015. By contrast, those minority groups made up 35 percent of the U.S. population last year, according to Census estimates. Some who oppose race-conscious policies have said they're encouraged by the Justice Department's inquiry, while supporters see it as political posturing by President Donald Trump's administration. Still, some advocates fear there could be a chilling effect among schools that will wonder if they'll face scrutiny next. Natasha Warikoo, a scholar of race and education at Harvard's Graduate School of Education, said research has indicated some schools already have been backing away from race-conscious policies. "I think that has to do with the legal context and this fear of being hit with a lawsuit, and the Justice Department just adds a layer to that," Warikoo said. Others said the Supreme Court has set a clear precedent upholding colleges' right to consider race. "The foundations are set and they are longstanding," said Art Coleman, managing partner of the Education Counsel consulting firm and a former deputy assistant Secretary of the Education Department's Office for Civil Rights under President Bill Clinton. "My hope is that it would do nothing to affect institutions that are pursuing issues of diversity and inclusion on campus."